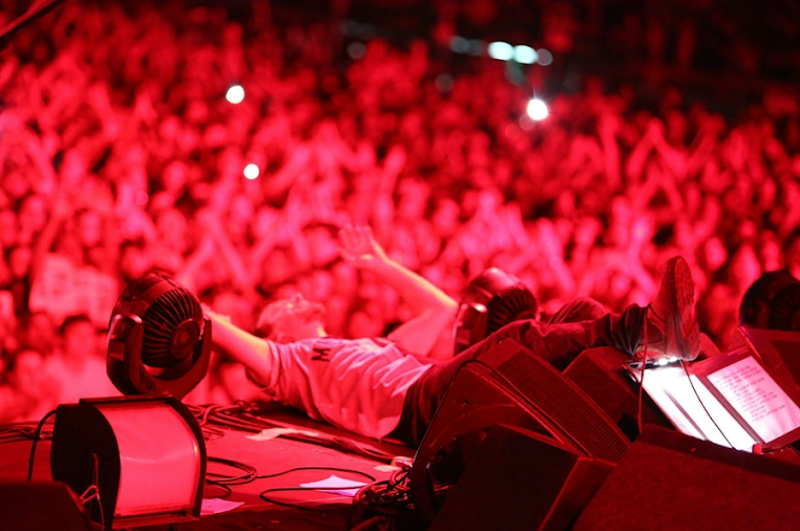 Pearl Jam is almost certainly touring the Eastern USA next year ... almost ... certainly. Maybe? As is often the case for our Top Ten lists, the most exciting Pearl Jam news this year was something that didn't even happen. It was a question, a debate, that lit the fanbase of fire and drove us all nuts! So what's the story? 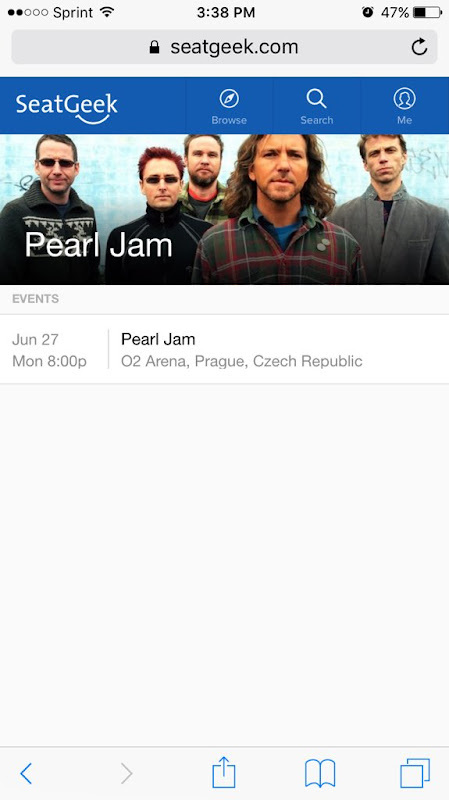 Word is, Pearl Jam was going to release some tour dates in November. They even told us to make sure our Ten Club information was up to date, a dead giveaway that dates are coming. Lexington Center even went so far as to update their sign. Nothing. The guys over at AlternativeNation know's a Ticketmaster employee's father's brother's nephew's cousin's former roommate who leaked a list of dates and promise of a January announcement. Questions abounded at Kelly Curtis's live twitter chat, but all answers were vague and noncommittal. As the year wraps to a close, none of this has quieted down. Apparently Pearl Jam cancelled on the Bridgestone Arena so they can play Bonnaroo. Just TODAY, I saw a tweet that they're heading back to Europe! What's true? Who knows, but we're excited! Pearl Jam's monthly newsletter comes on on the 10th. Maybe we won't have to wait much longer. This May (which was apparently a big month for the Top Ten), we said good-bye to David Letterman's Late Show. Pearl Jam and Eddie are no strangers to that show, so it was, perhaps, fitting that Eddie was invited to perform on the finale. He song choice, fitting as well ... well, if you don't listen to the lyrics, Betterman. 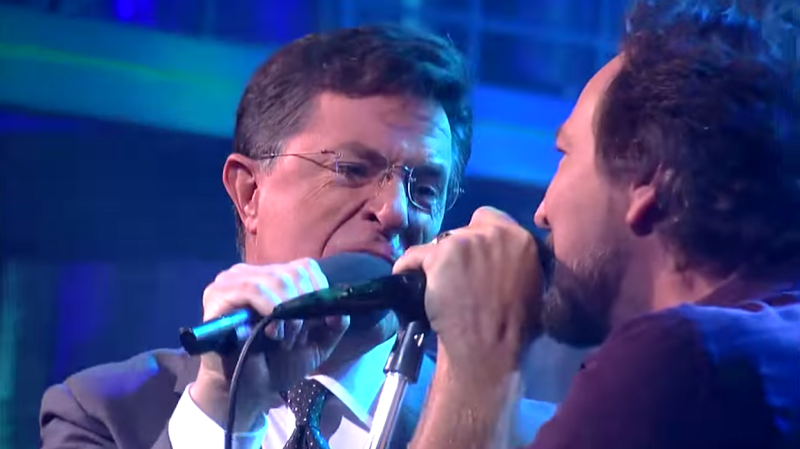 After Eddie's performance at the Letterman finale, it didn't take long for Pearl Jam to pop back up at The Late Show, this time hosted by Stephen Colbert. As part of the lead up to the Global Citizen Festival, the band sat down for an interview with Colbert in September then played a scorching version of Mind Your Manners and invited Colbert onto the stage for Rockin' in the Free World. 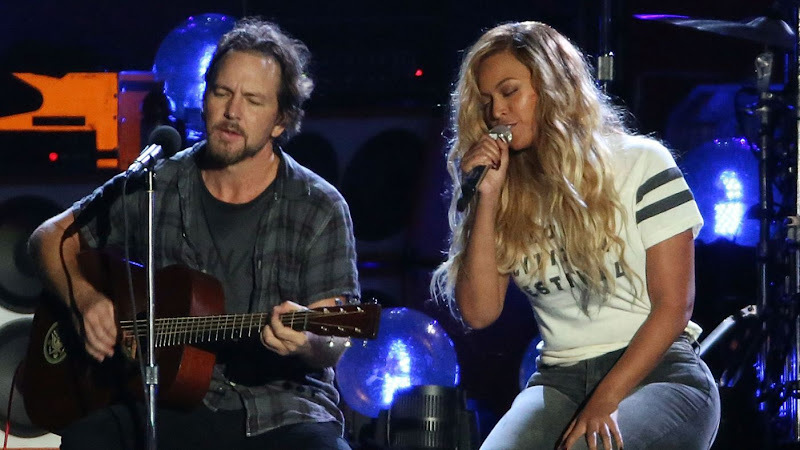 As Pearl Jam's only US performance began to round up, Eddie invited Beyoncé onto the stage for a cover of Marley's Redemption Song, a song Pearl Jam hasn't touched in over 20 years. Maybe they just needed the right singer. And hey, if Beyoncé isn't enough to get you excited, the band threw in another cover of Rockin' in the Free World with a stage full of folks, including Bill Nye! With Pearl Jam touring so little this year, the band was able to focus some of their love for other projects. This year, that seemed to mean paying tribute to some amazing musicians. In January, Mike McCready joined the Seattle Symphony to play songs by Mad Season and Temple of the Dog. At various points during the performance Mike was joined by Barrett Martin, Duff McKagan, Chris Cornell, Matt Cameron, Jeff Ament, Stone Gossard, and other. The performance was so epic that later this year it was made available on CD and LP. In May, Ed took the stage with Pete Townshend to pay tribute to The Who and raise funds for Townshend's Cancer Foundation. And finally, in August, Mike stepped on top of Pike Place Market with Duff McKagan, Barrett Martin, and Mark Arm for a free show of songs by Iggy and The Stooges that celebrated the new home of KEXP. 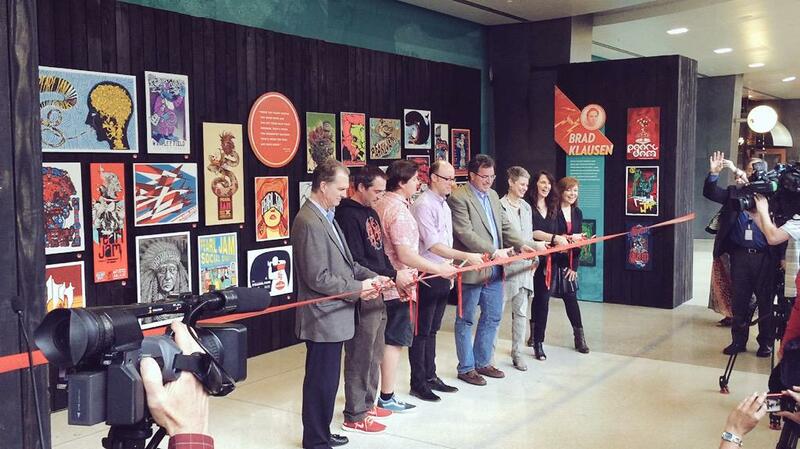 In May, Pearl Jam and the Experience Music Project (EMP) Museum coordinated to open a huge poster display at the Seattle-Tacoma Airport. Fans on the road could breeze by and enjoy the history of Pearl Jam's relationship with more than 30 artists including the Ames Bros., Brad Klausen, Munk One, and Ward Sutton. 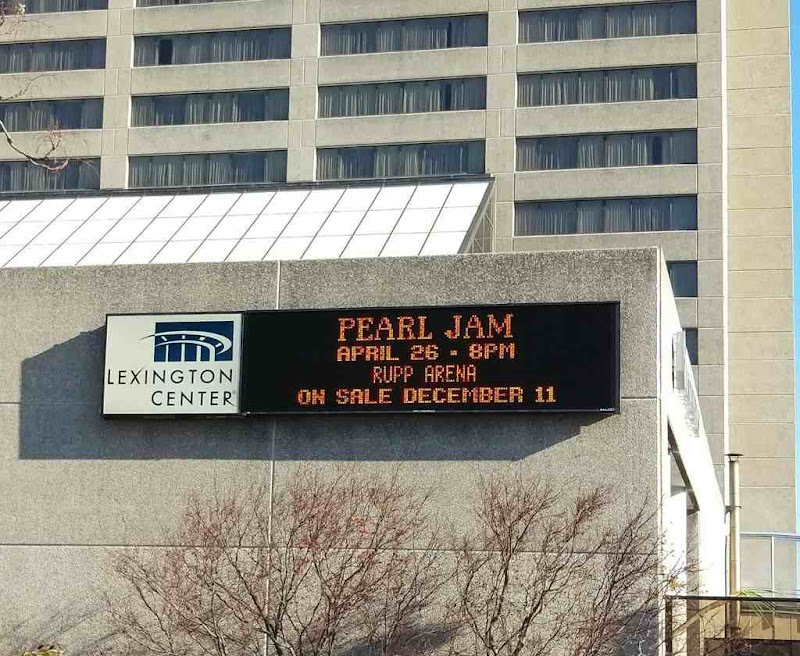 The official press release said "these myriad posters illustrate some of Pearl Jam’s core artistic values: the desire to foster a climate of creativity, to act as a patron for the other artists, and to provide comment and critique on society and humanity." 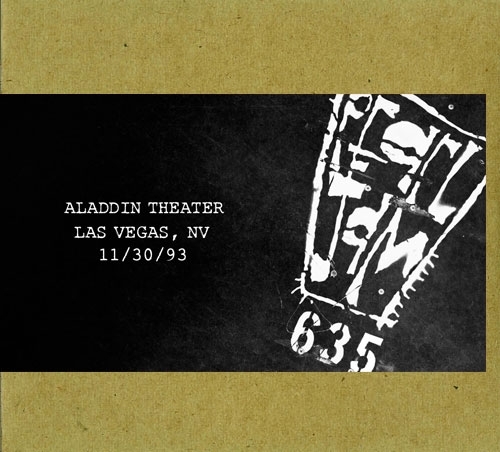 In 2006, Pearl Jam released their first ever Vault release, Las Vegas 1993, an action that since has been erased from the history books by the powers that be. The digital download has not been available to fans since. Pearl Jam made good on this slight this past May by release "Vault Release #5." Fan Club members who were swift were able to get a two-disc vinyl collection. That vinyl is no longer available, but fans can still purchase a CD or digital release of this classic show at Aladdin Theater on November 30th, 1993. With only ten tour dates and no studio releases, this was a quiet year for Pearl Jam. After two years of touring in support of Lightning Bolt, we expected a quiet year as the band members spent some well-earned time with their families recharging. Still, we've dug up a few things to look back on. 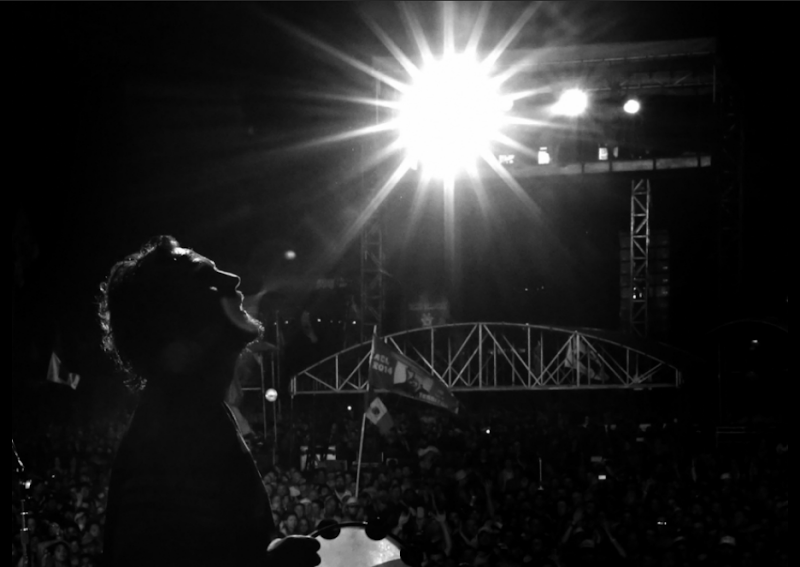 To complicate matters, we're bad at deadlines, so here are your Top Ten Pearl Jam moments of 2015 three at a time! Technicalities put this into the 2015 list. Judd Apatow interviewed Ed in the lead up to Lightning Bolt's release as part of some promotional videos, but we got that interview as well as interviews with other band members and the band as a whole in piecemeal chunks. 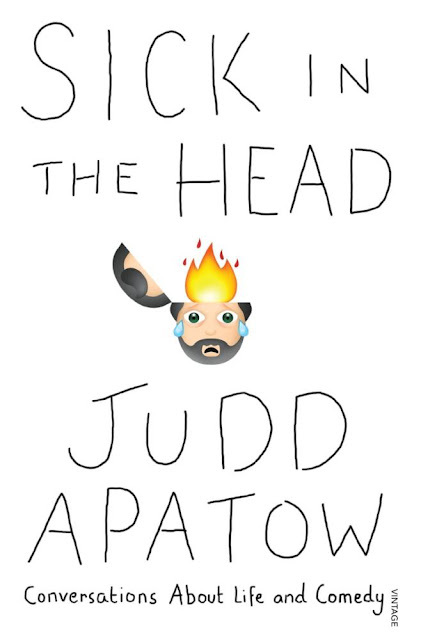 This year, Judd Apatow release Sick in the Head, a book that compiles interviews he's had with comedians throughout his career. Ed, though not a comedian, earned a spot by being a kindred soul to Apatow and having a career trajectory that is not indifferent from your average comedian. If you missed reading it, head to your local library or pick up a copy at Amazon with your Christmas cash. Being fans of a band that only releases an album ever 5 or so years, means not getting a chance to see a lot of songs debut in concert. That was even more noticeable this year with so few concert dates. That's why Pearl Jam's first ever live performance of Pink Floyd's Comfortably Numb during the encore in Porto Alegre made this year's list. 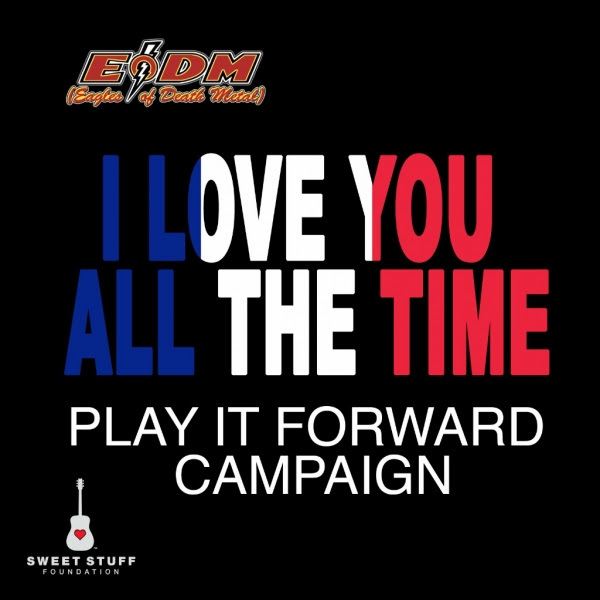 After terrorists left 89 dead in an attack at the Paris show by Eagles of Death Metal, the music community rallied in support of the band and their fans. Pearl Jam were no exception. They covered Eagles of Death Metal's song, Want You So Hard, at their Belo Horizonte show on November 20th (and for the remainder of the tour. ... and dedicated John Lennon's Imagine to the band and their fans at their Rio de Janeiro show. Earlier this month, Pearl Jam even produced a single including their Rio performance of Want You So Hard and a Matt Cameron cover of another Eagles of Death Metal song, I Love You All the Time. You can get that single as a digital download or pre-order a 7" vinyl right now. 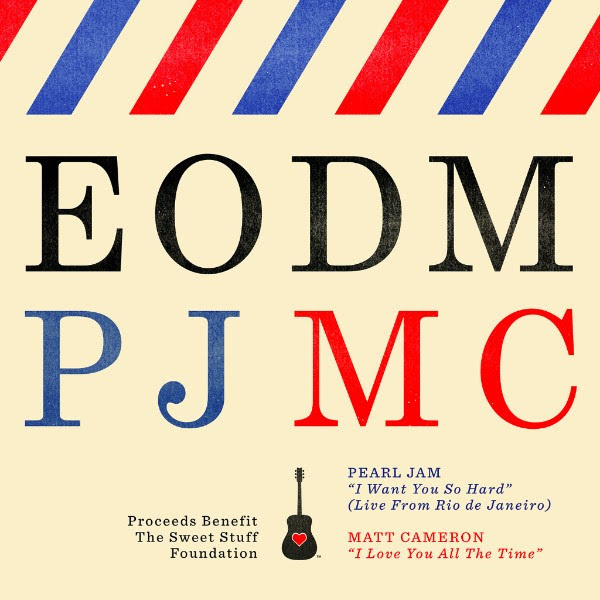 Pearl Jam has announced that they are releasing their cover of Eagles of Death Metal's I Want You So Hard from Rio de Janeiro as a digital download and a 7" vinyl single with the proceeds benefitting The Sweet Stuff Foundation. The song is paired with a B-side of Matt Cameron covering I Love You All the Time. Track info: “I Love You All The Time” written by (Hughes, Homme, Nishita). Performed, recorded and mixed by Matt Cameron. “I Want You So Hard” (Bad Boy News) -- Eagles Of Death Metal. Performed by Pearl Jam (Jeff Ament, Matt Cameron, Stone Gossard, Mike McCready, Eddie Vedder). You can purchase the digital download for $3 at PearlJam.com or pre-order the vinyl for $10 (plus $6 domestic S&H). 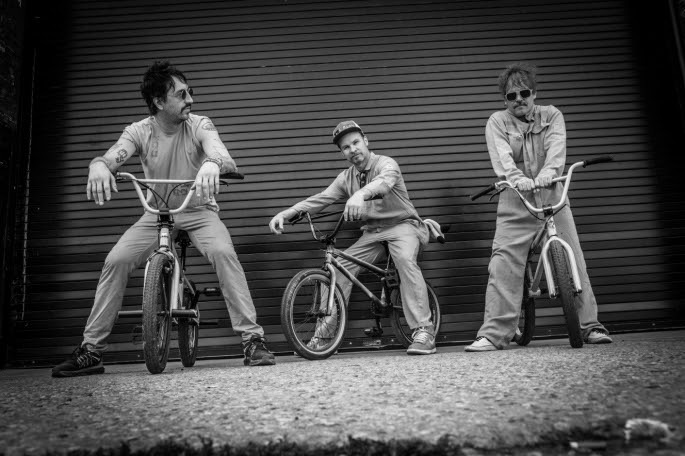 RNDM (featuring Pearl Jam bassist Jeff Ament, singer-songwriter Joseph Arthur and drummer Richard Stuverud) announces a seven-date North American tour in support of the band’s forthcoming sophomore LP, Ghost Riding. RNDM’s tour kicks off with an album release show on Friday, March 4th at The Crocodile in Seattle and wraps on Tuesday, March 15th at Double Door in Chicago (full dates below). Tickets for all dates go on sale Friday, December 18th at 10am local time. This marks the first time since 2013 that the band will perform live. Start thinking up questions, because in less than three hours, Kelly Curtis will begin a Twitter Live Chat. Drop your questions with the hashtag #PJLiveChat to be considered. Live chat starts at 2pm PT! If you have questions for manager Kelly Curtis ask using the hashtag #PJLiveChat. 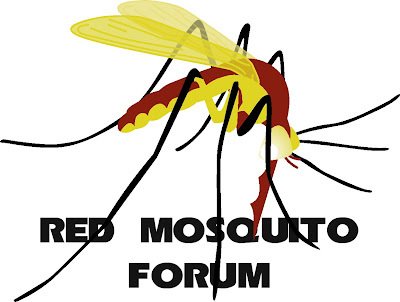 May we suggest some topics? When the heck are you going to announce your April tour dates in the US? When will you release a recording of Pearl Jam's Destination Weekend? When will you release a recording of Pearl Jam's show at Wrigley Field? When is Eddie's next solo album coming out? When can we expect the No Code Super Deluxe Boxed Set? When will Pearl Jam tour [insert name your hometown regardless of how recently Pearl Jam has been there]? Are Pearl Jam releasing Lost Dogs II? Has Pearl Jam finished their 11th album? Why does Matt Cameron drum so fast? 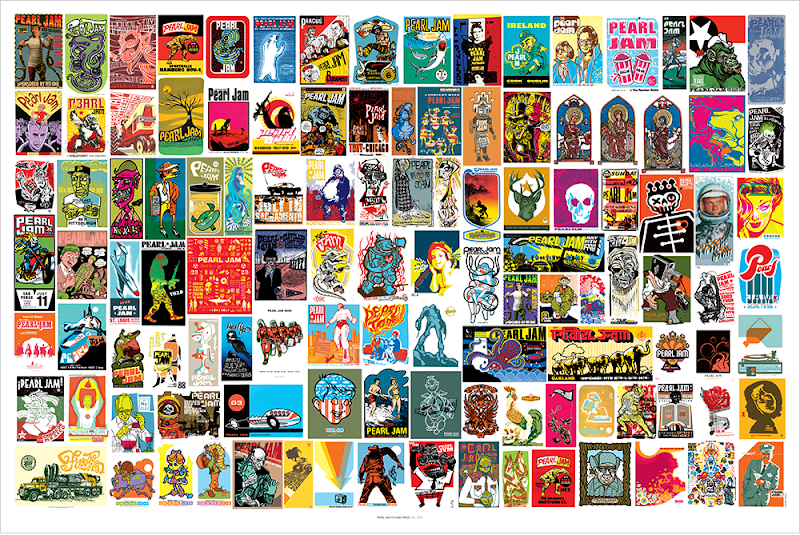 It was is apparently the first in a series, Ames Bros has released a poster with 100 tiny posters from their collection of Pearl Jam posters. The poster is 2ft X 3ft, making each mini poster ... well, small. 24" X 36" Offset print. Printed using fluorescent inks and spot varnishes on sturdy 80 lb. paper. 1st volume of the series, featuring over 100 posters from the Pearl Jam archives. Volume One of our "poster of the posters", as we call it. Poster created in conjunction with the current "Push Me, Pull Me - Pearl Jam and the Art of the Screen Printed Poster" exhibit at Sea-Tac Airport, Seattle, WA. These posters are also featured in our book, Pearl Jam vs Ames Bros: 13 Years of Tour Posters. Get one at PearlJam.com or AmesBros.com for $25, or get a signed copy from Ames Bros for $35.